• Disposition of remains: Under a law passed in 2015, the Disposition of Remains Act was amended by a major piece of transgender rights legislation that grants dignity and respect at the time of death. The law allows Illinoisans to designate their gender identity, expression, and pronouns in written funeral and burial instructions and requires that those wishes be followed. • Hate Crimes: The Illinois Hate Crime Act protects individuals based on their actual or perceived sexual orientation, which is defined as homosexuality, bisexuality, and heterosexuality. Although gender identity or gender expression is not specifically listed in the act as a protected category, according to the Illinois Department of Human Rights, state law protects actual or perceived gender identity under the current hate crimes law by including it as a provision of sexual orientation. An amendment to the Act, effective January 1, 2016, has the first specific inclusion of transgender people. It will specifically name gender identity as a protected category. The federal Local Law Enforcement Hate Crimes Prevention Act (Matthew Shepard/James Byrd, Jr. Hate Crimes Prevention Act) specifically includes gender identity as a covered category. • Medical Care: Medical care providers cannot refuse to treat a patient simply because of the patient’s gender identity. • Restrooms: As a general rule, you can use the restroom consistent with your gender identity. If confronted, you are not obligated to produce identification to prove your gender, and you are protected by public accommodations laws in Illinois. • Health Insurance: Denial of health insurance coverage, coverage for claims related to gender transition, coverage for claims for gender-specific care, and coverage for claims unrelated to gender transition may be considered health insurance discrimination. Health insurance companies should not drop your coverage or refuse your application for coverage because you are transgender. Illinois law prohibits discrimination against transgender people by places of public accommodation, and insurance has been held to constitute a public accommodation. It is important to review health insurance exclusions, generally located in a benefits plan summary. A vast majority of health insurance companies exclude all or most coverage for treatment related to gender transition, such as hormones, counseling and surgery. Some language is so broad that it may deny coverage to a transgender person for treatments unrelated to transitioning. • Housing: The Department of Housing and Urban Development (HUD) clarified its policies to include discrimination against transgender individuals as an enumerated violation of the Fair Housing Act. HUD also ensured that all of its core programs, including public housing, rental vouchers, and home financing, would be open to anyone who needs them, regardless of sexual orientation or gender identity. • Passports: The Department of State updated its policy on passports and certificate of foreign births to allow transgender individuals to receive a new document that reflects their gender. The policy was further updated in 2011 to affirm that individuals wishing to change their gender marker on a passport only need a document from a physician stating that they have undergone a “medically appropriate” procedure to change genders, thus standardizing and streamlining the entire process. 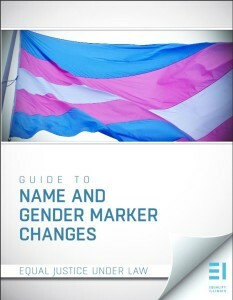 Changing names and documents is a sometimes difficult task for transgender individuals. Equality Illinois has designed a tool kit to take you through the process of changing one’s name and obtaining a new birth certificate, driver’s license, Social Security card, and passport as well as to provide information regarding your obligation for registering with the United States Selective Service Administration, including the forms you may need and the government offices to contact. You can read and download the Equality Illinois booklet “Guide to Name and Gender Marker Changes” here. Even with the tool kit, working through the maze of county, state and federal government offices, their forms and the fees can be a challenge. The Gender Marker and Name Change Project, a pro bono clinic at The John Marshall Law School, created in cooperation with Equality Illinois and assisted by the Seyfarth Shaw law firm, provides free, confidential legal services for name and gender maker changes by appointment for all Illinoisans. Call the clinic at 312-427-2737, ext. 477 to make an appointment. The office line is staffed from 9 a.m. to 4 p.m. on weekdays. If you believe you are a victim of gender identity-motivated discrimination in housing or employment, the Illinois Department of Human Rights can assist you in filing a claim. For most cases, a claim must be filed within 180 days of the alleged incident; a full year is allowed for housing cases. You will need to provide current contact information for yourself, the organization/person alleged to have discriminated against you, and any witnesses. You must also provide the date of the most recent incident and any supporting documents. To learn more about the requirements of the Illinois Human Rights Act or to file an employment discrimination complaint, visit the Illinois Department of Human Rights website (En Español). If you are the victim of a hate crime, call 911 or your local police department. Once a police report has been filed, your local officials are required by law to report the incident to the Illinois State Police for investigation. In Chicago, after you call the police at 911, you can contact the city’s Commission on Human Relations to accompany victims to court hearings, visit hate crime victims, and provide referrals for important support services. Much of this information is summarized in the Equality Illinois “Know Your Rights” pamphlet. You can make your own 3-fold pamphlets for personal use or multiple copies for your organization. You can see and download it HERE.